PROMO: Buy 5 Get 1 Free, for regular priced ticket (Php 1,200) until FEBRUARY 25, call 0975 919 3179 and 0916 522 2689 for tickets! Joe Henson, aged 26, is quite new to the professional theater world but not with performing on stage. Coming from a musically inclined family, he has been exposed to music at a young age and has experience with the stage at 14. The vast majority of his exposure has been in singing in church and performing at Sunday school Christmas productions. He found his passion for theater and the arts in high school when he joined the drama club while he lived in Malaysia. It was there where he tried his hand in script writing, stage management, and directing for the following productions Around the World in 80 Days (2006) , Enchanted (2007), and Arianna (2008). In 2007, he also joined his first Hiphop Dance Competition and bagged 2nd place with his group. He then continued to perform with local Malaysian hiphop group, Danzity till he graduated high school in 2009. In college, Joe ventured into the indie-music scene of Manila by performing in several gigs with his friends as a solo artist and doing duets with other up-and-coming artists. He did this while pursing his degree in Behavioral Science and later on he finished his post-graduate studies in DLSU. In 2013, he stopped performing and became a full-time student. After graduating, he then pursued a 9 to 5 job in Public Relations and events and eventually got involved in community work. Joe is currently freelancing in various projects and events while getting more involved in the ministry of his church. His involvement in I Remember A Boy will be his first musical performance since high school . Regardless of where his path takes him, he believes that he will always have a passion for the arts. This will be Kendrick's first show with Artist Playground and is ecstatic to be working with great friends in the industry. He just finished the second run of 9works Theatrical’s A Christmas Carol and was recently a part of Disney's Newsies and American Idiot of the same company. Aside from this, he was also part of the cast of Jersey Boys of Atlantis. Kendrick has also done several shows with Treehouse Theater Production, Kids' Act Philippines and Repertory Philippines. When he is not doing theater, Kendrick is also a professional events hosts and you can see him hosting birthday parties, debuts, weddings, corporate events and etc. Shalee Madelaine Vicencio is currently taking up her Bachelor of Arts degree Major in Performance in Media Arts at La Consolacion College Manila. She made her theatre debut in Repertory Philippines’ Seussical the Musical. She has also been part of Repertory’s Alice in Wonderland, The Wizard of Oz and Disney’s Camp Rock: The Musical. 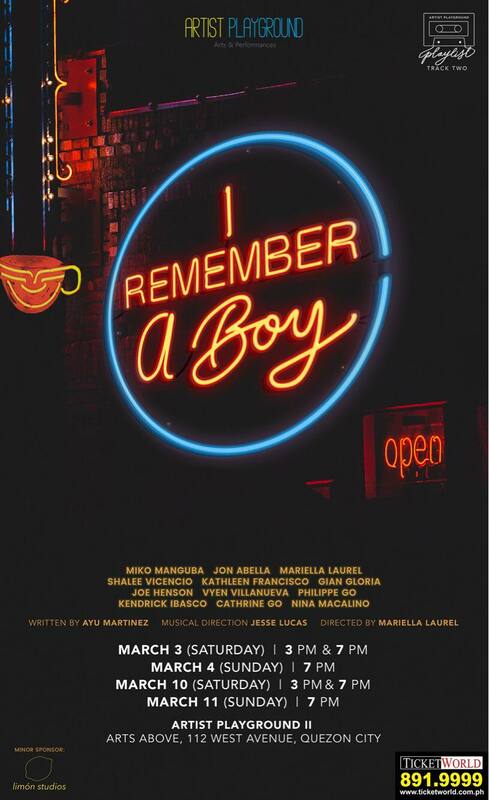 One of the grand winners of GMA Network’s singing reality show “To The Top,” Miko Manguba takes it a notch higher and explores acting for the first time through “I Remember A Boy”. Miko is the vocal arranger, music producer, and leader of Top One Project (T.O.P. ), GMA’s all-male singing group, who won PMPC Best Group of the Year in 2016. Most of their songs were used as theme songs for several Kapuso telenovelas especially for Mulawin Vs. Ravena with their rendition of the song “Ikaw Nga” originally by South Border. Mariella Laurel is a freelance performing artist who also finds joy in Directing, Film production work and teaching Musical Theatre for children. She’s been gracing the stage through countless opportunities that started at young age of 9. Sparking her interest for musical theatre was her first professional role in a musical as Crystal in Floy Quintos’ Lives. With that growing passion for theater, she actively participated in Brent International School Manila’s voice and dance trainings, sang for the choral and performed in annual productions, such as The Fantasticks as Luisa, Pippin as Catherine, Godspell as Robin, and Grease as Marty. She was a singer and officer of De La Salle Innersoul, De La Salle University - Manila’s Pop Vocal group, while completing her BA in Communication Arts. Since graduating in 2015, her most notable theater work include Shrek The Musical as Baby Bear, Villager, Tap Rat and Dulocian (ATEG, 2014), Lagablab as Chayong (AP, 2016), A Christmas Carol as Scrooge’s Mother/Poulterer (9 Works Theatricals and Globe Lives, 2016 and 2017), Baby B as Baby B (AP, 2017) and Prelude to Macbeth as Lorna Stewart (AP, 2017). Apart from stage performances, she lends her voice for TV and Radio advertisements, hosts and performs for corporate events, acts for short films and television. I REMEMBER A BOY marks her debut as Director and being able to do this production again in 2018 truly leaves her even more grateful and determined to make her mark in this industry! Since 2015, her most notable theater work includes MLQ: Ang Buhay ni Manuel L. Quezon (Full House Productions, 2015) The Little Mermaid as Princess Sapphire (Trumpets Inc., 2015), Dog Sees God as Tricia/Peppermint Patty (Twin Bill Theater, 2016), Queen Of The Universe as Sarah Wurtzbach (STAGES, 2017); and Baby B as Amy Ocampo (Artist Playground, 2017). Her line up for corporate events includes major brands such as PLDT, Nestle, Nickelodeon, Jollibee, Johnson and Johnsons, Maybank, Personal Collection, SM Malls, Megaworld and much more. Aside from her theater credentials, she lends her voice to local advertisements, hosts and writes for corporate events and parties. She also works as the marketing manager and consultant for the following theater and events companies: Trumpets Inc for Trumpets Playsho and Playhouse, Twin Bill Theater Productions, ArtSource and Artist Playground. With her passion for storytelling and creation, Kathleen also worked alongside the creative team of I Remember A Boy, heavily contributing as their Marketing Head and Artistic Consultant. Philippe Go is a product of Trumpets Playhouse and played Papa Ge (Once On This Island) and Mr. Ostrovsky/Carl Grubenniere (25th Annual Putnam County Spelling Bee) in their 2016 and 2017 annual showcases, respectively. His most recent role was with Make Believe Productions where he portrayed the Pilot in their interactive musical adaptation of The Little Prince. A chemist by profession, he entered the pop music scene after being chosen by Lea Salonga in The Voice of the Philippines Season 2, thereafter becoming known as "The Singing Chemist." This was followed by numerous guesting stints as song interpreter in UNTV's A Song of Praise Music Festival making it all the way to the grand finals in 2015. Cathrine Go is a full-time freelance performer, performance-maker, actor and theater artist-teacher. Won as Best Actress in Sikat Awards in 2013 and an Aliw Awards Best Actress nominee for the year 2016 for Rody Vera’s Happiness is a Pearl. She is one of the resident actors (The Players) of Artist Playground, member of Tag-ani Performing Arts Society, member of The Scenius Pro and Scenius ProActives and performer in Party with Jive. She took several trainings for theater and other artistic disciplines at PUP Sining-Lahi Polyrepertory, PETA-MTTL and Artist Playground. It was 2015 when she was chosen to be the Philippine Delegate for Dramatic Arts in ROK-ASEAN held in Korea National University for the Arts, Seoul, Korea. Some of her notable performances are her portrayals for Maikling Dasal, Mahabang Gabi, Mabuhay ang Bagong Kasal, Hindi na Muli, Happiness is a Pearl, Mulagat, Prelude to Macbeth and M Episode. Her other performances includes her participation with Tag-ani’s music album – Saka Lamang Papayapa and her performance for the recent KoryoLab 2017. Gian is a graduate of De La Salle - College of Saint Benilde with a Bachelor's degree in Digital Filmmaking. She recently appeared in Green Day's American Idiot and A Christmas Carol of 9 Works Theatrical and Globe Live. In 2014-2016, she became part of the Manila, Paris, and London run of Marco Polo: An Untold Love Story, A New Musical under Artists Theatre Co. UK wherein she played the roles of Princess Kogajin and Princess Toragana. Gian was one of the first five representatives of the Philippines and the whole Asia in the Euro Pop Berliner Perle, a singing competition in Europe held annually in Berlin, Germany wherein she placed 4th. She was nominated as Best New Female Artist in the 27th Annual Aliw Awards and was also one of the Top 40 finalists in the very first Philippine Idol (TV 5). Gian made her professional debut on stage in Kids Acts Philippines' The Little Mermaid. Since then, her theater credits include: Beauty and the Beast, The Fantasticks, Peter Pan, Aladdin, Romeo and Juliet, Mulan, Hansel and Gretel, The Wizard of Oz, and Pinocchio. She released her debut album in 2013 entitled "This Is Me" available in all digital stores worldwide. Vyen started performing after undergoing various musical theater and acting workshops. Currently, he is the Artistic Coach of REDph, a contemporary Dance Team he built with Michelle Kawpeng. After completing his Master's Degree in Applied Mathematical Finance from the Ateneo de Manila University, he continued working as an Investment Counselor but his passion for the arts never dimmed. Vyen's professional theater debut was in 9WT's production of Disney's Newsies, followed by A Christmas Carol. Vyen considers himself a banker by day and a full-time performer for life. Ang Nawalang Kapatid as Yudistira, Ang Dressing Room as Kiiko, #R</3J as Mercutio/Marky, Katatawanan Ng Kalituhan as Balthasar/Duktor Kurot, Isang Panaginip na Fili as Imuthis, and a musical under Dulaang Lab entitled I Love you Because where he played the awkward socially awkward Austin. He enjoys ensemble work as well in productions such as: Shock Value, Rizal X, Noli the Opera, Titus Andronicus, Fake, Orosman at Zafira, Ouroboros, and Ang Huling lagda ni Apolinario Mabini. He was a pit chorus member, guitarist, and assistant musical director for Bit by Bit company’s Maxie the musicale.